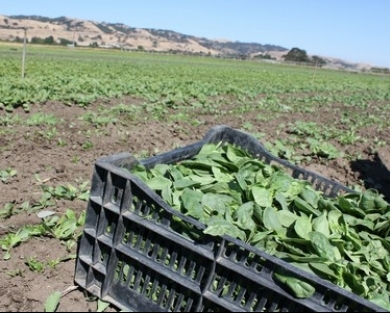 Our spinach, like all of our salad greens, is field grown, hand cut and brought to market almost immediately after harvesting and pre-washing. 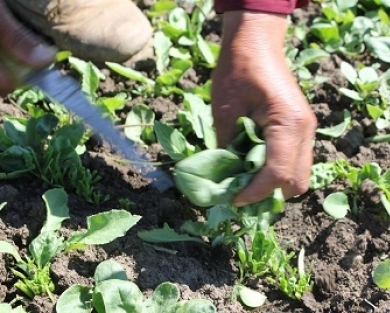 This is why it lasts so long in customers' fridges, and also, partially, why its quality is so spectacular - conventional or large scale machine harvesting can usually damage to most tasty, tender baby greens, but when cut by hand, our greens show up in pristine condition in the prime of their flavor. It's sweet and mildly succulent, and also super rich in chlorophyll, iron and folic acid. I kind of imagine it's what a giant four leafed clover would taste like - the experience can be rather magical. Happy Boy tries to harvest spinach year round - the hardest time to grow spinach is actually in the dead of summer, when sometimes the heat is just too intense. Luckily, we usually have the coastal fog to insulate things enough. 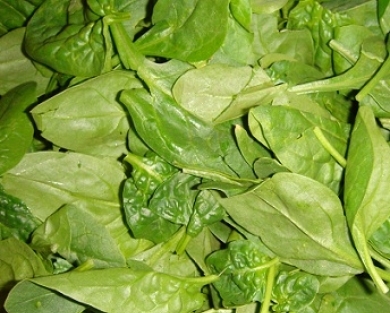 Spinach can be eaten raw in salads, or used to top things like breads and pizzas. Its bright green juice is a potent tonic, and can also be used to flavor and color pastas. Use it to make pesto and creamy soups or add it to other sauces like marinara. Wilting spinach with hot olive oil also makes for some delicious warm winter salads. Very versatile, spinach pairs well with shallots, citrus, apples, dried fruits and nuts, dairy products like yogurt and feta cheese, eggs and dried salty meats like prosciutto or salami. As a basic dressing, I usually use olive oil and balsamic, occasionally mixing things up with a splash of tamari. Spinach is thought by some to be one of the world's healthiest foods! It's an excellent source of iron, magnesium, potassium and calcium. It also contains heaps of vitamins A, C and K, and folate. If oxalic acid is a concern, boiling for just one minute reduces its concentration while preserving much of the nutrition. Our baby spinach is ideal for salads - raw or wilted. Spinach pairs well with fruits, nuts and cheeses. It's also great in pasta dishes, on pizza or as a last minute addition to soup.